It is always exciting to hear news of a new journal – and especially so when it is open-access and published free of charge! One of the major developments in mid to late 20th century biblical studies was the way research began to set the figures of Jesus and Paul within their distinctively Jewish contexts. Rather than viewing them as prototype Christians, New Testament scholars began to draw upon contemporary Jewish literature in order to understand them within a Jewish environment. Following the publication of Geza Vermes’ Jesus the Jew (1973) and Ed Sanders’ Paul and Palestinian Judaism (1977), the Jewish setting of Jesus and Paul have been widely acknowledged. It is therefore great news to hear of research that explores these Jewish roots (and their continuity) within early Christianity. Published by Eisenbrauns, the Journal of the Study of the Jesus Movement in its Jewish Setting (JJMJS) proposes to look at the inter-relationships between Jewish and Christian traditions during the first seven centuries of Christianity. Pseudepigrapha, Dead Sea Scrolls, rabbinics, patristics, and archaeology and, in the increasingly fragmented world of biblical scholarship, is exactly the sort of initiative this area of study needs. This creates a wonderful sense of dialogue and joint exploration. Peer reviewed articles (some by top specialists in their fields) can be read online or downloaded (free of charge) in pdf format. An exciting additional feature is the online forum. As far as I know this is an innovative step by Eisenbrauns and could lead to some interesting conversations and responses to the published articles. It will be really interesting to see how this catches on. Eisenbrauns should be applauded for this venture. 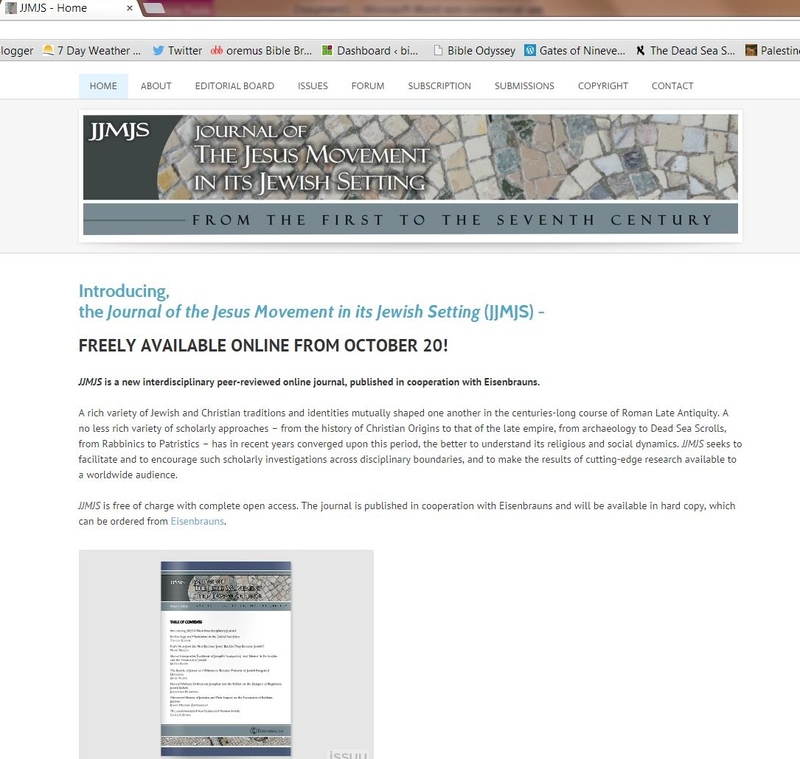 The JJMJS looks like a really worthwhile addition to scholarship in early Christian and early Jewish studies.